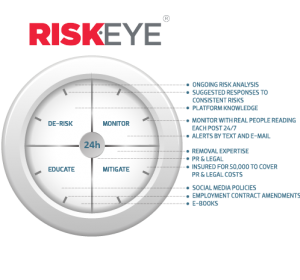 RiskEye - Online reputation security risk experts for when words hurt. We keep businesses safe online. Experts in online harm - we prevent, protect and fix issues as they arise in real time. With specialist AI risk software supported by live analysts we know and understand harm. Why you need RiskEye to protect your online reputation. Customers and other stakeholders continually assess your business online through multiple platforms, search engines and websites, with new posts coming online day and night. Fake, untrue or malicious posts can present serious risks that impact your business. We offer a complete, insurance-backed solution to help you identify and mitigate threats to your online reputation. Protecting online reputation isn’t a part time job. We understand risks you could miss on your own and we know what to do when risks arise. Our complete insurance-backed protection package. Not every threat requires an escalation, sometimes access to an informed opinion is all that you need. The online world is legally complex and rapidly evolving, from defamation to employee rights. Our legal experts are here to help. Knowing there is funding and expertise behind you to deal with any potential damage leaves you free to focus on your business. As well as the service packages below, we offer a range of custom services designed to meet a variety of potential requirements. Please contact us to discuss your specific needs. This service is designed for businesses who use closed private networks, such as Facebook and LinkedIn which cannot be tracked, or who don't have an extensive online presence but still require risk protection and mitigation services. 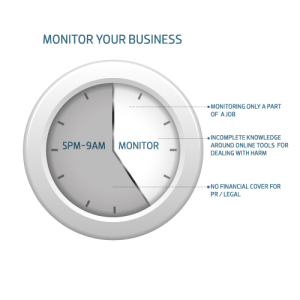 Our most popular service provides 24/7 risk tracking and live assessment of your Twitter and Facebook fan pages to analyse risk, with live alerts and 24hr customer helpline and support. This service includes everything in our Resolution package, with the addition of tracking mainstream media news sites, blogs, forums, YouTube, Vimeo, local media, digital radio and relevant websites. "With RiskEye we’re now ensuring that the view people have of our hotel online is as polished and pristine as the view they get when they arrive at our door"
The Swan Hotel & Spa, The Lake District, Cumbria.